In 2015, police detained Khairuddin and his lawyer, Matthias Chang, for two months in 2015 under the Security Offences (Special Measures) Act, a law used to deal with terrorist activities. Khairuddin alleged that his detention was carried out in bad faith as investigators and prosecutors of several countries had later declared that investigations were being carried out into money laundering and corruption involving funds related to 1MDB. In 2015, police detained Khairuddin n his lawyer, Matthias Chang, for 2 months in 2015 under the Security Offences (Special Measures) Act, a law used to deal with terrorist activities. ALING JAYA: The High Court has fixed five days from April 22 to hear a suit for unlawful detention and malicious prosecution filed by 1MDB critic Khairuddin Abu Hassan. Lawyer Mohamed Haniff Khatri Abdulla said the dates were fixed after a case management before Judicial Commissioner Darryl Goon Siew Chye in chambers. “The judge has also given the directive to parties to file pre-trial documents before Nov 29,” he said. On May 4, Khairuddin filed the suit against the government seeking damages for being unlawfully detained three years ago after lodging reports overseas about funds missing from 1MDB. He claimed that he was maliciously prosecuted and sought RM8.83 million in damages. He had named seven people in the suit, including former inspector-general of police Khalid Abu Bakar, ex-attorney-general Mohamed Apandi Ali and the Malaysian government. Former attorney-general Mohamed Apandi Ali along with former inspector general of police Khalid Abu Bakar has been directed by the Kuala Lumpur High Court to file their defence by July 6 in reply to a suit by Citizens Declaration coordinator Khairuddin Abu Hassan. Khairuddin filed his suit seeking RM8.83 million in damages from the government for what he claims was wrongful detention under the Security Offences (Special Measures) Act [Sosma] 2012 three years ago. Today’s directive was made by deputy registrar Catherine Nicholas following case management. She also ordered the other defendants in the suit namely police investigating officers Wan Aeidil Wan Abdullah, M Chelliah and Habibi Majinji; deputy public prosecutors Masri Mohd Daud and Awang Armadajaya Awang Mahmud and the government to file their defence. KUALA LUMPUR: After more than a year, the government has offered to withdraw its appeal against a Sessions Court’s decision to acquit 1MDB critics Khairuddin Abu Hassan and lawyer Matthias Chang of allegedly sabotaging the nation’s banking and financial services. Lawyer Muhammad Rafique Rashid Ali said the matter was made known to High Court registrar Nur Ain Mustapa during a case management yesterday. Rafique said deputy public prosecutor Faizah Salleh, who represented the government, had informed them of Attorney-General Tommy Thomas’s decision. “The appeal will be called up before judge Azman Abdullah on Aug 27 for the government to make a formal application to withdraw it,” he said. He said the withdrawal would mean that the Session Court’s decision remains. On May 19 last year, the government filed a notice appeal for the High Court to set aside the ruling of Sessions Court judge Wan Norisham Wan Yaakob to acquit Khairuddin and Chang of the charge. Chang, in a video posted on YouTube, subsequently claimed that the Attorney-General’s Chambers was appealing on the instructions of “the powers that be”. “Prime Minister Najib Razak is demanding a pound of flesh from me and my client (Khairuddin) by filing an appeal to the High Court,” he said in the video. Najib and his Barisan Nasional coalition were removed from power following the May 9 general election. 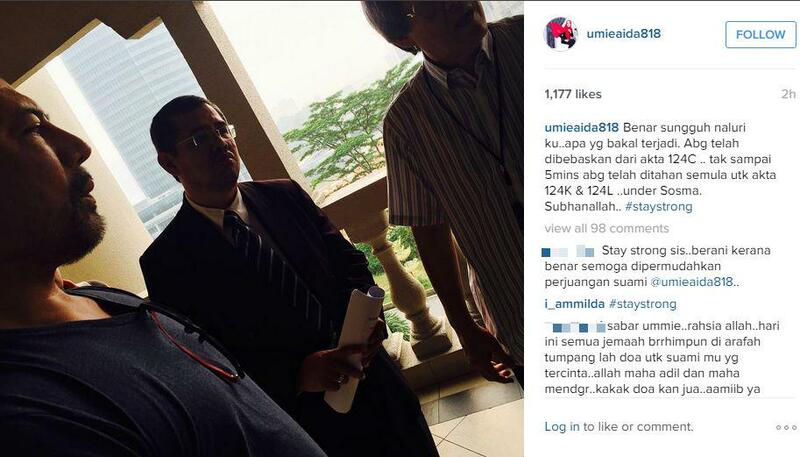 This was revealed by Khairuddin’s lawyer Mohd Haniff Khatri Abdulla today. Khairuddin was detained under Sosma after he lodged reports with foreign authorities on the matter of losses allegedly suffered by 1MDB. Khairuddin and Chang were charged for lodging police reports against the scandal-hit 1MDB in Switzerland, the United Kingdom, France, Hong Kong and Singapore between June 28 and Aug 26, 2015. Judge Wan Norisham Wan Yaakob said today an outright acquittal was appropriate as the prosecution had not presented any evidence linking them to the charge. Haniff told reporters after the judge’s decision that the verdict concluded both were innocent of the charge although police used the Security Offences (Special Measures) Act (Sosma) 2012 to detain them. “They were branded as terrorists,” he added. He alleged the government had conducted a malicious prosecution for framing a charge that had no connection with their actions outside Malaysia. Khairuddin Abu Hassan and Matthias Chang are expected to file a suit against Prime Minister Najib Abdul Razak for their detention under the Security Offences (Special Measures) Act 2012. Lawyer Haniff Khatri Abdulla, who is representing Khairuddin, said the lawyers have been directed to serve letters of demand on Najib, inspector-general of police Khalid Abu Bakar, Deputy Prime Minister Ahmad Zahid Hamidi and attorney-general Mohamed Apandi Ali. “All of them had issued statements against my client Khairuddin following his arrest under Sosma. “The claim is for malicious prosecution, defamation and unlawful detention that the two of them (Khairuddin and Matthias) faced, leading to the charge,” Haniff told reporters after the case. He said the suit would be filed after the letter of demands had been drawn up, and after Najib dissolves Parliament to call for the next general election. This, he added, was to ensure that the 1MDB issue would be discussed during the general election campaign. Their lawyer says the acquittal of the duo by the Sessions Court proves their innocence of the charge of financial sabotage. KUALA LUMPUR: Former Umno leader Khairuddin Abu Hassan and lawyer Matthias Chang, who were acquitted by the Sessions Court here today of a charge of financial sabotage, will sue the government for unlawful detention and malicious prosecution. 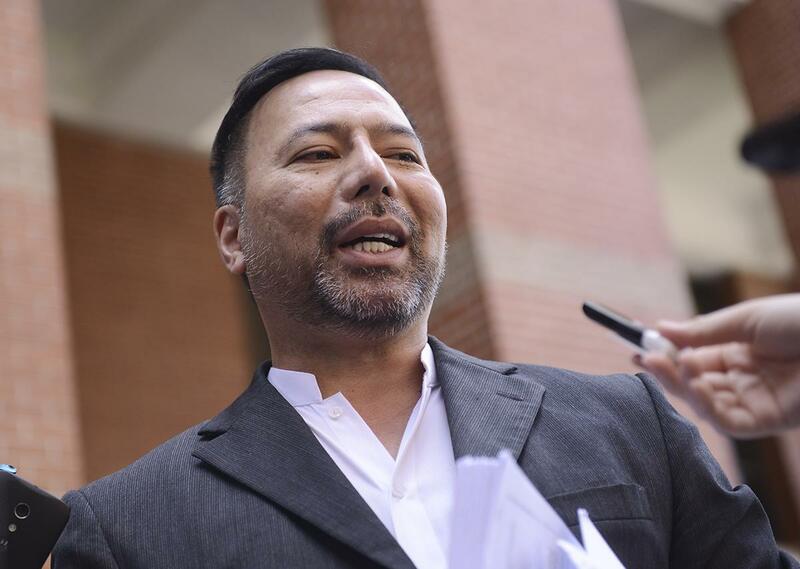 Khairuddin’s lawyer Mohamed Haniff Khatri Abdulla said the lawsuit would include an action for defamation by government leaders, including Prime Minister Najib Razak. “The suit will be filed after the Dewan Rakyat is dissolved for the coming general election,” Haniff said, adding the public ought to know about the unjust act done to Khairuddin and Chang. Yesterday, the prosecution discontinued its prosecution against the duo on a charge of sabotaging the nation’s banking and financial services, and sought a discharge not amounting to an acquittal for them. KUALA LUMPUR: The Court of Appeal has upheld the High Court’s decision that Datuk Seri Khairuddin Abu Hassan and his lawyer Matthias Chang cannot be charged under the Security Offences (Special Measures) Act 2012 for allegedly attempting to sabotage the banking and financial services. The three-member panel unanimously decided on Tuesday that there was no merit in the prosecution’s appeal, upholding the decision by the High Court last year. Khairuddin, 53, and Chang, 65, face charges under Section 124L of the Penal Code for allegedly attempting to sabotage Malaysia’s banking and financial institutions. The High Court decided last year that Section 124L of the Penal Code for the offence of attempting to sabotage could not be read together with Sosma 2012. The duo were charged in October last year with attempting to sabotage the country’s banking and financial services. Khairuddin was detained for 28 days under Sosma for allegedly sabotaging the country, an offence under sections 124K and 124L of the Penal Code. Lawyers for Liberty has criticised police for questioning lawyer Matthias Chang, who had acted for former Batu Kawan Umno vice-chief Khairuddin Abu Hassan and who is currently being detained under the Securities Offences (Special Measures) Act 2012. Chang’s client was being detained for 28 days under the anti-terrorism law on grounds of ‘sabotage’ after he lodged police reports in several countries over alleged financial misappropriation involving accounts linked to 1MDB and Prime Minister Najib Abdul Razak. “The police’s action against Chang clearly amounts to harassment of a lawyer who was merely performing his duties to act for his client without fear or favour. “Such harassment endangers the independence of the Bar and the fundamental principle of lawyer-client privilege by which all lawyers are bound,” said Lawyers for Liberty executive director Eric Paulsen. Chang, who was a former political secretary to former premier Dr Mahathir Mohamad, was yesterday questioned by police over his work for Khairuddin. Chang had accompanied Khairuddin in his police reports across the globe, which have triggered investigations in several countries including Hong Kong, US and Switzerland. Paulsen said lawyers must be allowed to carry out their work freely without improper interference. Lawyers representing former Umno Batu Kawan division vice-chief, Khairudd‎in Abu Hassan today filed a habeas corpus application at the Kuala Lumpur High Court. Khairuddin, 53, named Superintendent Habibi Majinji, the Dang Wangi district police chief, the inspector-general of police and the Malaysian government as respondents. The Umno member, who lodged complaints in Switzerland, France, United Kingdom, Singapore, and Hong Kong on the 1MDB, wants an immediate release from his detention under Section 4(5) of the Security Measures (Special measures) Act 2012. 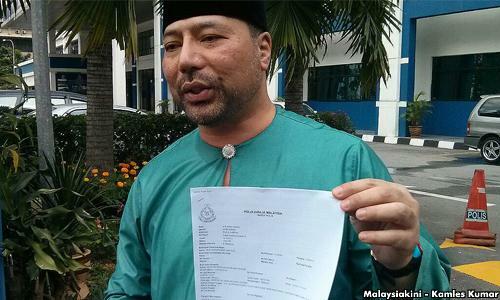 Khairuddin said the notice of his detention was against the provision to hold him under Sosma 2012. “My detention in using Sosma is an abuse of the law as I am not involved in terrorism activities,” he said. He said this is mala fide and that the justification was an after-thought by the respondents. The application was filed by the Messrs Law Practice of Rafique. In a separate statement, Parti Amanah Negara (Amanah) vice president Mujahid Rawa said the arrest is evidence of Prime Minister Najib Abdul Razak’s iron-fisted rule. “Khairuddin’s arrest and similar cases which curtails freedom to criticise a corrupt regime is now a symbol of an autocratic country under Najib. “Everyone who loves justice, regardless of political leanings, must rise to reject this oppression. “This is especially for Umno members, as the party had given life to an iron-fisted leader who now has his grip on the country we love,” he said. Police have postponed a scheduled meeting to question Matthias Chang, the ex-political secretary to former premier Dr Mahathir Mohamad. Chang yesterday said he was supposed to be questioned at 2pm today and had expected to be arrested but was later informed by police about the postponement. “It is now 10am at Dang Wangi,” he said in a text message. Chang, who is a lawyer himself, is being sought by police as he had acted for former Batu Kawan Umno vice chief Khairuddin Abu Hassan (photo) who lodged police reports across the globe relating to accounts linked to 1MDB and Prime Minister Najib Abdul Razak. This had sparked several international investigations including in the US, Hong Kong and Switzerland. Following this, Khairuddin, who is seen as a close ally of Mahathir, was barred from leaving the country and later arrested under Section 124C of the Penal Code which concerns activities detrimental to parliamentary democracy. Khairuddin was released a day before his remand expired and re-arrested immediately under the Security Offences (Special Measures) Act 2012, a law intended for terrorists, which allowed the government to detain him for 28 days. The wife of sacked Umno man Datuk Khairuddin Abu Hassan, Datin Seri Umi Khalsum Rahmad Ali said she was prepared for her husband to be detained for a longer period over reports he had lodged with investigators abroad against 1Malaysia Development Berhad (1MDB). Better known as Umie Aida, the local celebrity said it did not come as a surprise that her husband was rearrested after being released from remand today. Writing in her Instagram account, Umie said she was staying strong over Khairuddin’s rearrest for allegedly trying to “sabotage the state”. Khairuddin was rearrested today at 4.40pm under the Security Offences (Special Measures) Act (Sosma) 2012 just as he walked out of a courtroom at the Jalan Duta court complex where a magistrate had released him from remand. He was first arrested on Friday. His lawyer Matthias Chang said the former Batu Kawan Umno division vice-chairman was now being investigated under Section 124K and 124L of the Penal Code, which deals with sabotage and attempting to sabotage the state, respectively. His first arrest was under Section 124C which pertains to activities that are detrimental to parliamentary democracy. Former Umno leader Khairuddin Abu Hassan was arrested by police this evening, just hours after posting on Facebook that he is being investigated for submitting evidence related to 1Malaysia Development Berhad (1MDB) to the Swiss attorney-general in Bern, Switzerland. Khairuddin, the ex-Batu Kawan Umno division vice-chief, was picked up from his home this evening and was taken to the Dang Wangi district police headquarters. Lawyer Matthias Chang confirmed the arrest. “Yes, he was picked up from his house. He is being taken to Dang Wangi,” Chang told The Malaysian Insider. 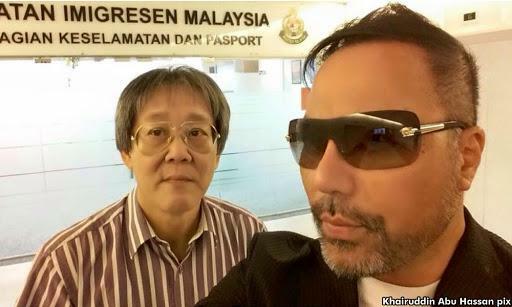 Earlier today, Khairuddin and Chang were stopped from leaving the country by immigration officials at the Kuala Lumpur International Airport. Khairuddin told The Malaysian Insider that police had directed the Immigration Department to prevent him from leaving Malaysia. “That’s right, I’ve been barred from leaving the country by the Immigration Department on the orders of Bukit Aman,” he had said through Whatsapp. Writing on his Facebook later, he said police had summoned him for questioning at its headquarters in Bukit Aman, Kuala Lumpur, on Monday at 11am. Former Umno leader Khairuddin Abu Hassan has been arrested tonight for attempting to topple the government. His lawyer Matthias Chang told Malaysiakini that Khairuddin has been brought to the Dang Wangi district police headquarters and is being investigated under Section 124C of the Penal Code. “He was arrested sometime between 6 to 7pm at his residence in Mont Kiara,” Chang said when contacted. It is understood that he was arrested by officers from Bukit Aman. Khairuddin was detained just hours after saying he didn’t give a damn about the police and was prepared to be arrested. Earlier today, the former Batu Kawan Umno deputy chief discovered that he and Chang (photo) have been barred from leaving the country. He was supposed to go to Bukit Aman on Monday for questioning over documents he submitted to the Swiss authorities regarding the 1MDB scandal. Besides Switzerland, Khairuddin has also lodged reports on 1MDB in London, Singapore, and Hong Kong. He said he did so to fight for the people against Prime Minister Najib Abdul Razak. Former Umno leader Khairuddin Abu Hassan said he is not afraid of being arrested for lodging police reports overseas on the 1MDB scandal. “If (Bukit Aman) wants to arrest me, it won’t be a surprise. “I am prepared for any action from their side. I don’t give a damn about them,” he told Malaysiakini. The former Batu Kawan Umno deputy chief and his lawyer Matthias Chang have been barred from leaving the country, reportedly on Bukit Aman’s orders. “The 1MDB scandal is an international case involving multiple countries including Switzerland. “Meeting with the Swiss AG and giving evidence is not wrong… We have lodged multiple police reports (in Malaysia) but there has been no action,” he said. Khairuddin said he found out that he could not leave the country this morning, when he was supposed to fly to New York and London. “The trip was for matters regarding 1MDB. I’m not going to lie. I’m not like the government,” he said. 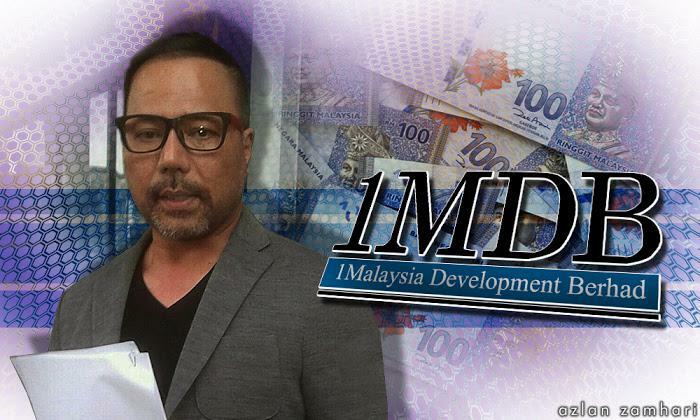 Besides Switzerland, Khairuddin has also lodged reports against 1MDB in London and Singapore. This entry was posted in 1MDB, khairuddin abu hassan arrested, matthias chang, sosma and tagged 1MDB, acquitted by sessions court, appeals court: cannot try chang and khairuddin under sosma, khairuddin abu hassan, matthias chang, sosma detention. Bookmark the permalink.